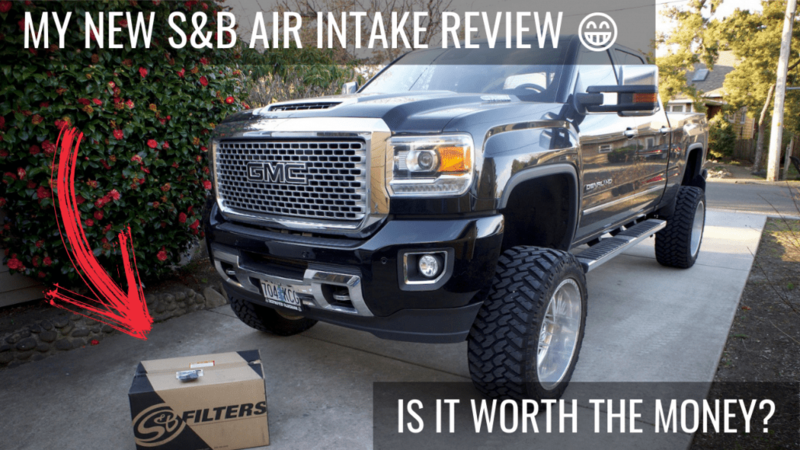 卵So is the S&B Air Intake Any good? Does It feel or sound different? After just installing it I take it out to find out. I can’t say that I noticed any difference in sound at all. Even when I laid into it, it still sounded stock in the cab. I was really hoping to hear a little more spooling but no dice. Honestly, I knew to not expect much from this, but it is a necessary piece to get before adding more fuel with other mods. This and exhaust which will come eventually (thats what she said). 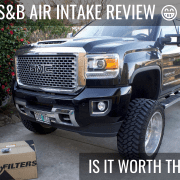 If you are on a budget (which Im not sure why you would be if you own a new Denali) go with a K&N filter. If you have the $$$ Any of the intake kits will be great. I just prefer the cost and look of the S&B over the Banks and the AFE. I always get AFE but the one I wanted was $440. I can buy a lot of other cool stuff for $140. That is why I went the direction I did. Now in the future, I will plan on also putting in a banks power tuner and 5″ exhaust as well to get 80+HP. I will also be doing a full delete so I can get amp steps that tuck in and then crank the lift up to 9″ and put 37’s on. I figure I will do all of this around 50,000 miles when I have used up a lot of the warranty. Hindsight, I probably would pass on the warranty and spend the money on other things. I will update this as I test it out more over the next couple of weeks. If you have any questions or comments, be sure to leave them below.